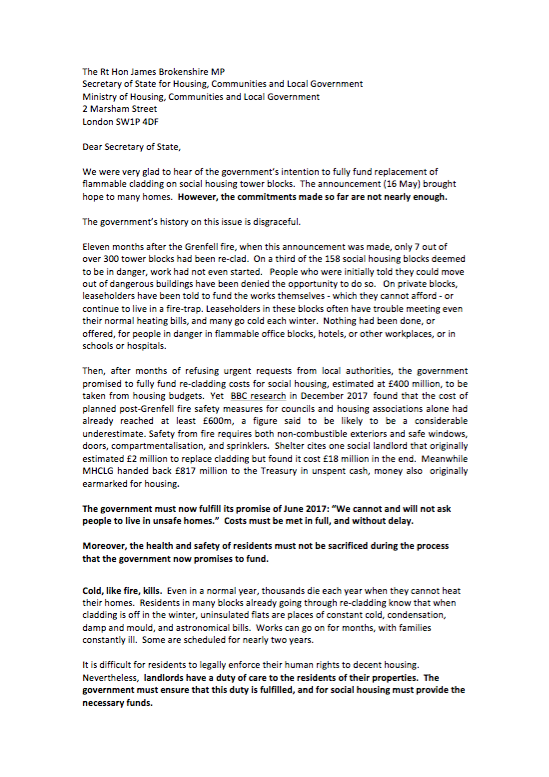 Before the government conceded the principle by promising to “fully fund” the replacement of Grenfell-style cladding, FPA had collected over 60 signatures from MPs, community organisers, campaigners, trade unions, and resident associations on an open letter that demanded that the government release the money to make people safe and warm. Though the victory in £400 million cannot be understated, the money and promises don’t nearly go far enough in ensuring peoples’ homes are made safe from fire, nor does it promise vital guarantees to keep people warm over the winter when remediation works are underway and cladding and insulation is off. FPA spoke to many people left out in the cold and suffering in freezing homes last winter, whilst their insulation was off. Cold, like fire, kills. FPA have redrafted their letter and sent it out to be signed. 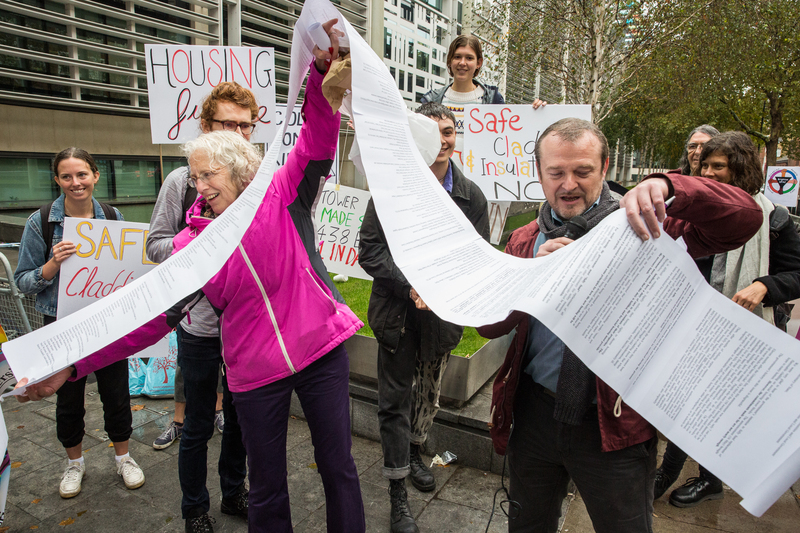 The new letter presses on a set of urgent demands that the government needs to meet and will be delivered to the Secretary for Housing, Communities and Local Government this October. 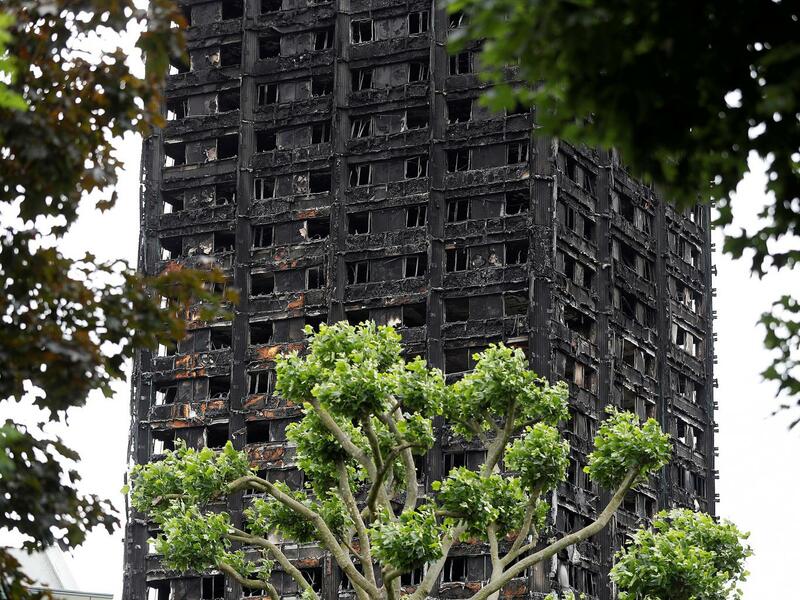 On the anniversary of Grenfell, I have been asked to write this blog post describing what its like living in a high-rise building with dangerous cladding on it like Grenfell had. My name is Elizabeth and I live in a 22 story high rise housing association block in Salford, managed by Pendleton Together and owned by Salford council. The block has flammable cladding. And a year on from the tragedy it still has the cladding on it except for the first three floors. And it’s been terrible living here since the tragic events for several reasons. Since the Grenfell fire me and several residents haven’t been able to sleep well and have been too scared to sleep, especially in the first few weeks. We were first promised that if anyone wanted to move they should just go to the Housing Association and they would look at our cases fairly. 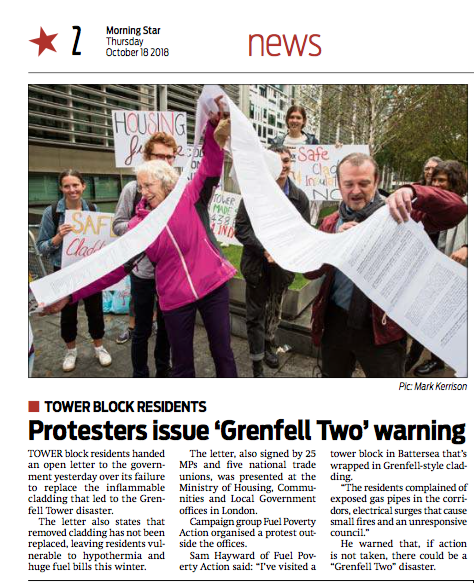 But unfortunately many residents, even the ones with kids on high floors and people with health problems and people with doctors letters recommending they are moved, have been denied a move. This has upset residents a lot since many kids and people with health problems died in Grenfell . We have been told that removing the cladding is going to take two years and that they’re looking at installing sprinklers in the all the high rise blocks. 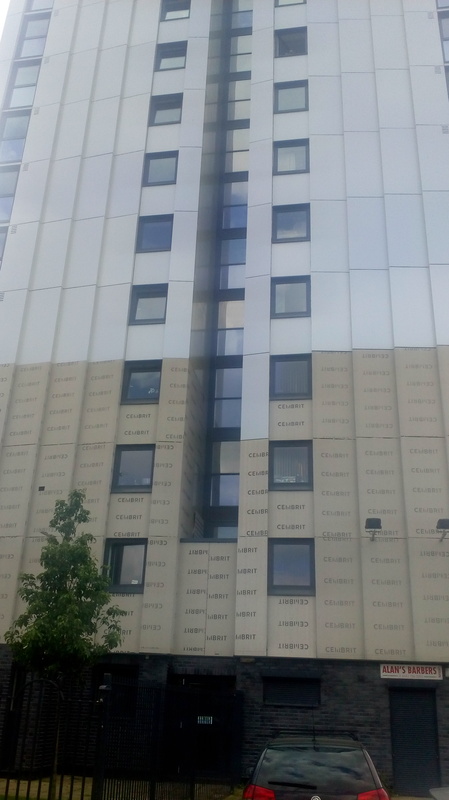 A month after the Grenfell fire the mayor of Salford, Paul Dennett , said he would remove the cladding and that he wouldn’t wait for the report from the national and local government on testing whether the cladding that’s on our blocks is flammable like Grenfell. And that he would borrow £25 million pounds to get the cladding off and keep residents safe. Unfortunately, Pendleton Together only removed the first three rows, and a year later my block and many other blocks managed by Pendleton Together still have the major part of the cladding still on. Cladding only came off for the camera news crews and work stopped when the camera and TV news crews stopped filming. There was a meeting I attended about a month after the Grenfell tragedy, which was held in Salford youth theatre, where the deputy mayor and other various speakers came to talk about Grenfell. When the meeting got heated the deputy mayor of Salford said we should be thankful he came, as he didn’t have to come to the meeting to let local residents know what the Salford Council was going to do about our unsafe home. He stated that the Salford council only had £25 million in its reserves, unlike Kensington and Chelsea, the council that the Grenfell Tower falls under. In my block there is an internal fire alarm. When it goes off it only rings in the two exit stairwells which are located at both ends of the building, not the hallway, not the flats as it’s not connected to ring all the fire alarms to alert residents there is a fire in the building and to evacuate. The fire alarm is so quiet because the sound is coming from the stairwell. When it goes off, many residents don’t hear it. I and others have complained about that but nothing has been done. We have had four fire alarms where residents had been told to evacuate the building and many residents were still inside with their kids and said they didn’t hear it. That’s no surprise since nobody lives in the stairwell. I slept through one fire alarm as I couldn’t hear it as I was sleeping and it’s too quiet. If you have the TV or music on you might not hear it, or if you’re sleeping. Secondly we have no fire blankets or small fire extinguishers to put out small fires, like many flats have for safety. Thirdly we have no Tenants Association due to the fact the housing association locked us out of the community room and said not enough people attend the meeting. We usually have between 5 and 10 people at our tenants meeting, but they said it’s not enough. So we can’t make an official complaint as the Tenants Association meeting as we aren’t official. It’s been like that for two years now. Our community room has never been open to the tenants officially, it’s been used by the cleaners and by other blocks for their meetings, which is very unfair. We were promised raised beds to grow vegetables and fruit since many residents are on low incomes. We were hoping to donate the vegetables and fruit to the food bank but that never materialized even though it was on the plans of the refurbishment of the block. We also have very expensive heating system called the NIBE system , that many residents can’t afford and that other housing associations have had to rip out due to expensive bills that it causes for residents. 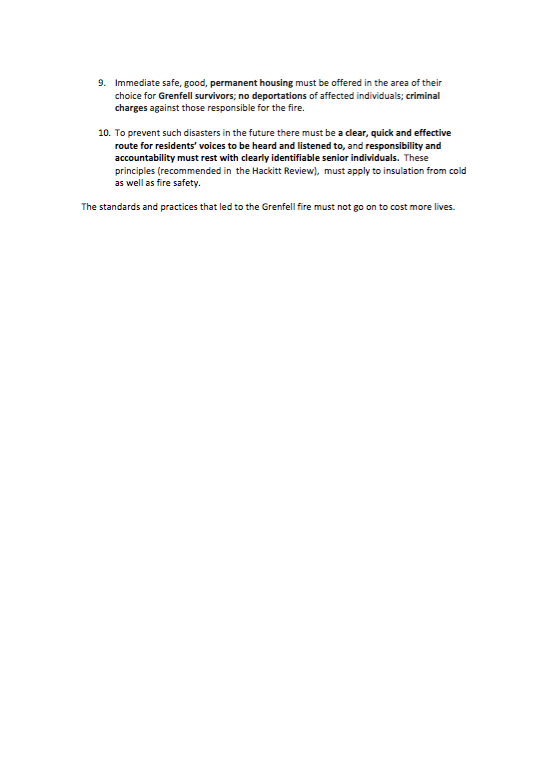 Residents have complained about the NIBE but the Housing Association has just blamed the residents and said they haven’t use the NIBE properly. The major refurbishment of our block included an electricity installation, and it’s caused many power surges that have tripped the electricity in my flat and others’ flats. My cooker which was only a year and half old tripped my electricity and cut all my electricity off in my flat due to a power surge. I called out the housing association, they sent an electrician who said it was my cooker. I then called the manufacturer who tested my cooker and said there was nothing wrong with it. My friend who lives in another flat also had problems with her cooker ever since the electricity refit. Her cooker is not working properly. We have never been offered any compensation and being unemployed I had to pay the bill just for the manufacturer to tell me there nothing wrong with my cooker. Grenfell residents and their blog was complaining about the power surge since their refurbishment. It’s really worrying that we having the same problem. As it’s strange for a fridge freezer to catch fire. Rumours are that it’s the electricity surges and the upgrade of the block that made the fridge catch fire. I can’t know for sure but I don’t believe that fridges randomly catch on fire . After Grenfell I don’t trust the Tory Government , my local council or the Housing Association. It’s disgusting that a year after Grenfell many residents haven’t been rehoused. And that residents who live in high rises like Grenfell with this cladding are being ignored. Its stinks of class warfare to me. Our lives don’t matter in these austerity times. The housing association lastly have put fire marshalls who are meant to walk the floors 24 hours a day, but many residents have complained that they are always downstairs on the ground floor and never seen walking the floors. If the fire alarm goes off they are meant to run up stairwells , go on each floor and alert residents to evacuate the building, but in practice they only seem to be on the second floor or on the ground floor when the fire alarm has sounded, which has made many residents feel unhappy and unsafe. These are the reasons why many residents are unhappy living in these high rises, because their problems aren’t being addressed and they are being denied a move to safe accommodation. You can join the ‘Safe Cladding and Insulation Now’ facebook group to share your story and hear from others here. 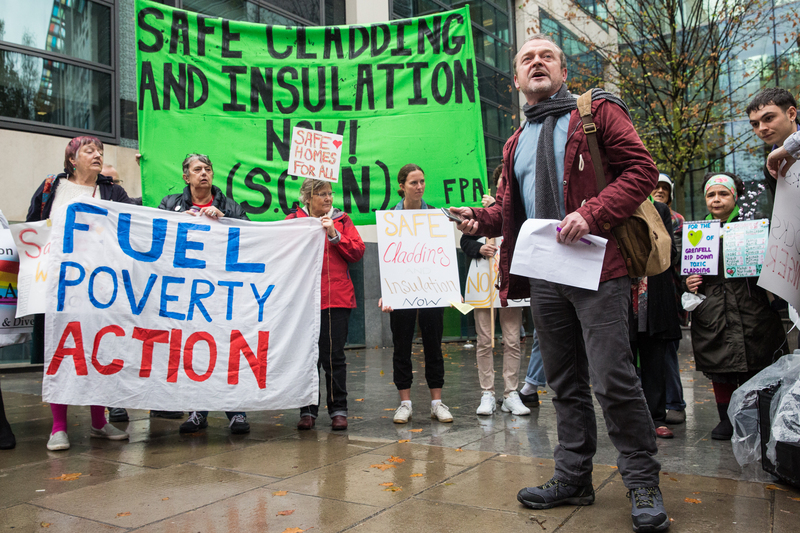 Full details of the Fuel Poverty action ‘Safe Cladding and Insulation Now’ campaign can be found in the Cladding & Insulation sections of our website. 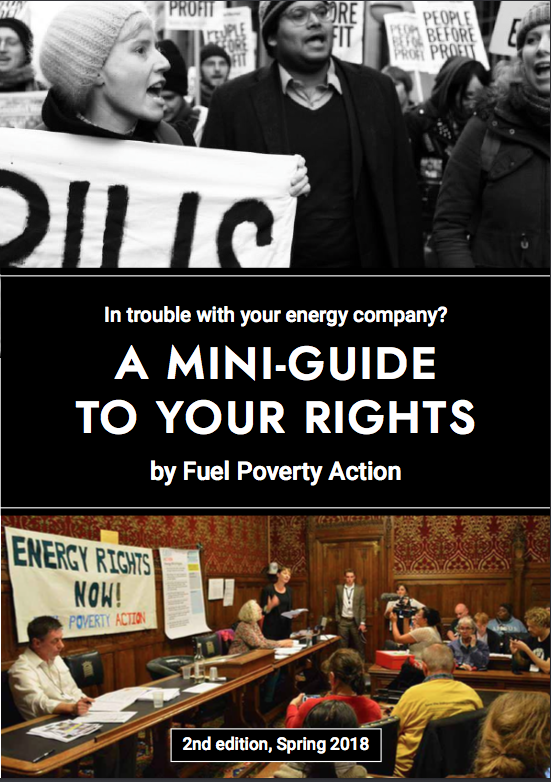 THURSDAY 17 MAY sees the launch of the second edition of FPA’s popular “Mini-Guide” to fuel customers’ rights in dealing with predatory energy suppliers. 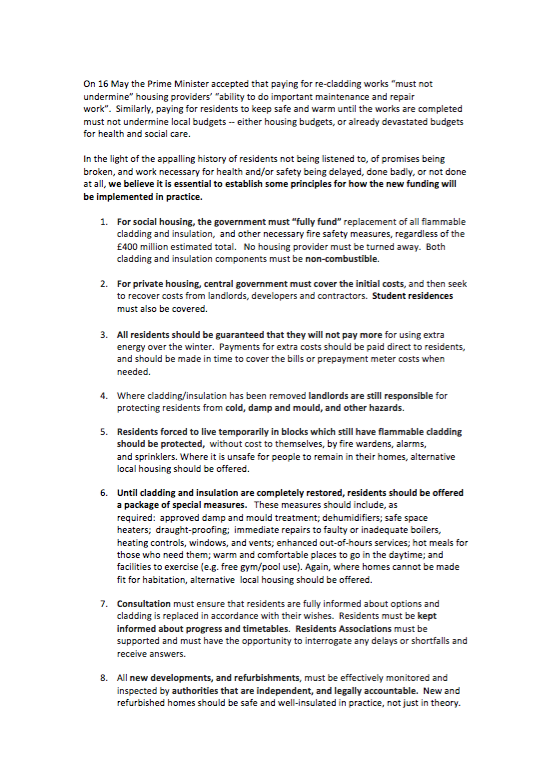 Now updated and expanded to include short sections on district heating and on landlords, the Mini-Guide is easy to read and down to earth, and it tells you what works — not what “should” happen. There is no need to register but please try to let us know if you can make it. This event will replace FPA’s regular monthly meeting but there will be time as well to discuss what is happening in our new post-Grenfell “SCIN” campaign for Safe Cladding and Insulation Now. SCIN is fighting for the people in high-rise blocks who’ve been left with flammable cladding, and for the others, who’ve had cladding removed, and will be freezing again next winter. There is growing support, and all sorts of possibilities! At 11am on Saturday local activists gathered at Brixton Reference Library to protest fuel poverty with a “Warm-Up”. After handing out leaflets and chanting slogans like “Warm homes are a right, Here to stay, Here to fight” in Windrush Square, they moved into the library and occupied the foyer for an hour. They sought to highlight that Lambeths’ libraries are a lifeline for many people, providing warmth, community, and access to vital services, and yet they’re threatened with closure. This will only exacerbate deaths from fuel poverty, which hit 43000 in the winter of 14/15, whilst the Big Six rip off the public by £1.7 billion a year. 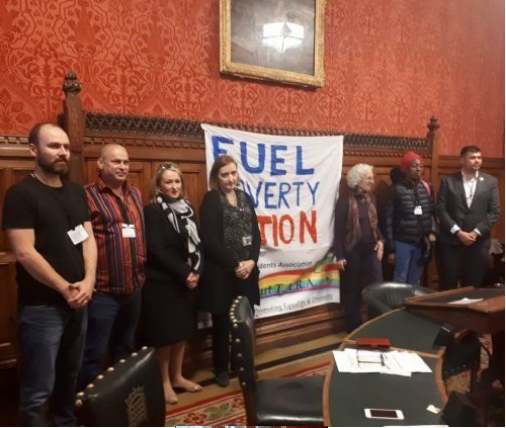 The action was called and organised by Fuel Poverty Action (FPA), Lambeth Pensioners Action Group (LAMPAG), Lambeth Older Peoples Alliance (LOPA) and Myatts Field South Tenants and Residents Association (MFS TRA). Lambeth pensioners, tenants and residents say, if we can’t afford to heat our own homes, we have a right to make ourselves cosy in any warm building! And we have a right to the information we need so we don’t have to freeze in the future. It cannot be right that every winter, thousands of people die from fuel poverty! Many people have kept warm – and kept informed – in local libraries. Now so many are sentenced to be shut, abolishing an essential community resource for the sake of ideological austerity. Other life-saving services in Lambeth, including day centres and lunch clubs, which many people use to get warm, meet friends, and stay informed, also under threat. 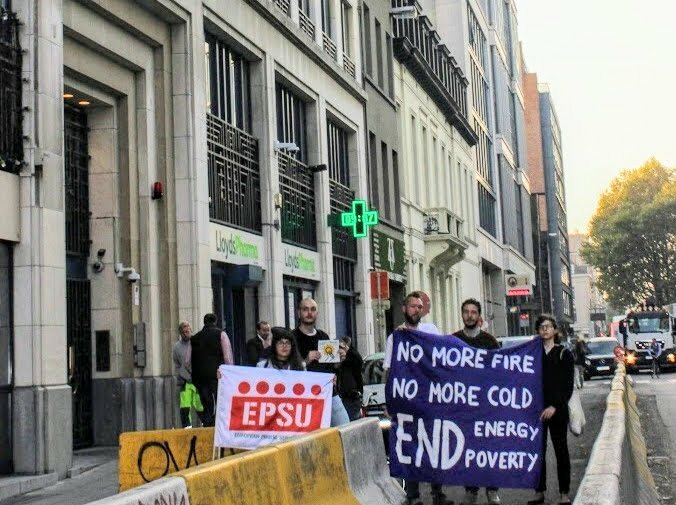 Meanwhile, the residents of Myatts Field South, having benefited from communal heating at a guaranteed flat rate – especially important for those who are old, ill or disabled – are now being forced into fuel poverty through the imposition of individual boilers by intimidation. They are fighting to keep communal heating and to get insulation and solar panels so they can keep warm. No one should have to choose between heating and eating. People everywhere are struggling to pay for fuel, while energy suppliers make record profits. And although we have some rights, we have no idea what they are! But it doesn’t have to be this way. Come join us at Brixton Reference Library on Saturday 19 March. 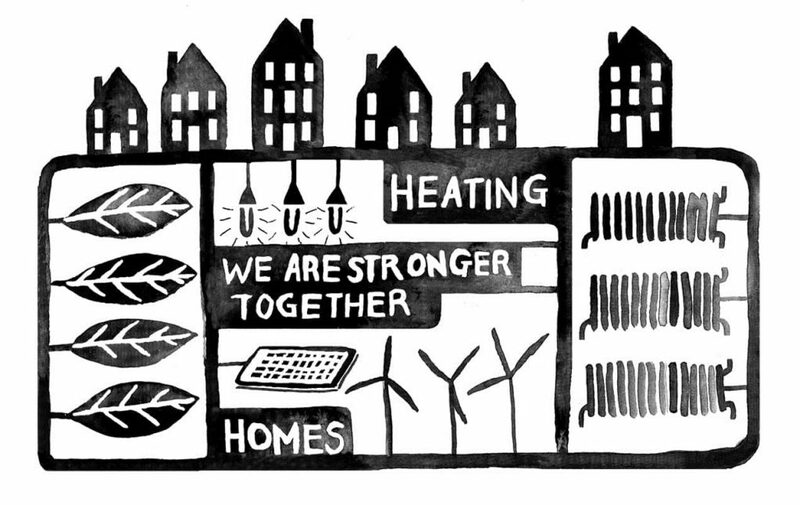 We will make visible the coldness that inhabits our homes and our society, and skill up so we can not only demand what we are already permitted, but so much more: warm, well insulated homes powered by communal and democratically maintained renewable energy, and public spaces which enable and nurture community. Bring your mum, your dad, your kids, your neighbours, and your experience – we are stronger together! Have you considered organising a late-winter ‘warm-up’ action? Based on the principle that we all have a right to come in from cold homes, these safe and friendly direct actions give people a chance to gather somewhere cosy, get information about their rights and speak about their own situations. They are often led by pensioners. In the past, ‘warm-ups’ have been held in shopping centres, a town hall, the Royal Festival Hall foyer, and a City of London bank. Last November, we warmed up in the House of Commons! See the report below, by journalist Mamasu Kallon. “If we can’t heat our homes, we have a right to warm up in any public building – including Parliament.” This was the stance taken by pensioners at a ‘warm up’ protest inside Parliament’s Central Lobby on Wednesday. 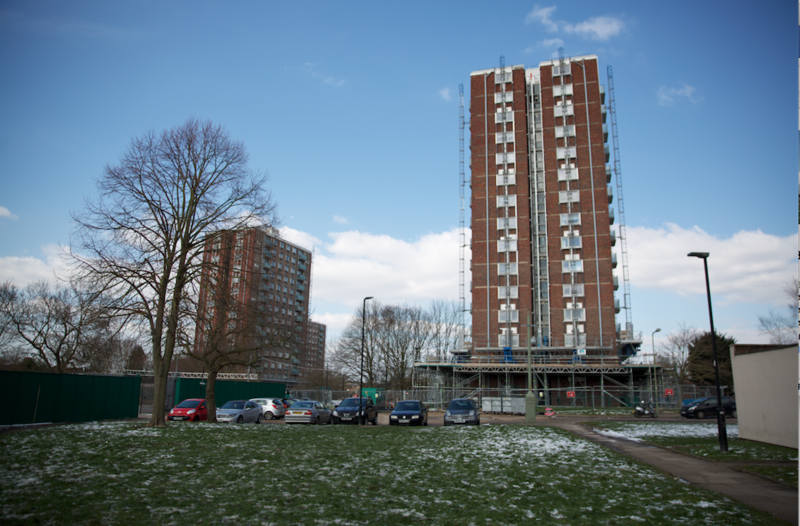 Myatts Field South tenants and residents fight for their heating system! 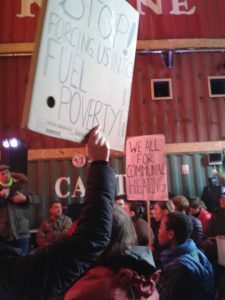 Residents on Myatts Field South estate are fighting Lambeth Council who want to replace their communal heating system with individual boilers. Several have been to court after refusing to let workers into their flats to install the new system against their will. Introducing Switched On London, a new campaign coalition demanding clean, affordable and democratic energy in the capital through publicly owned energy. The floods in Cumbria are a reminder of how close to home the impacts of climate change are being felt. Three once-in-a-hundred year floods in ten years aren’t an indication of terrible misfortune, but of a new baseline. As leaders and business executives meet in Paris with the outcome uncertain, in London the fight for clean, affordable energy is being taken in a new direction. In the face of a cartel of energy companies whose turn to renewables is far too slow — and whose profit-hungry business model leaves thousands struggling between heating and eating in the winter — Switched on London is a new campaign launching to build energy democracy in London. We demand that the GLA (Greater London Authority) sets up a new public energy company that works for people, not for profit. On 25 November, Fuel Poverty Action will take action in parliament against energy companies and welfare cuts. One of the reasons that I am going is that I have been in personal dispute with Southern Electric for about a year. They take a lot of money from me and I do not like it.